The seventh season of The Walking Dead opens and closes with two of the show's most moving episodes. This season is all about Rick's journey from a broken man to rising from the ashes to come back anew. So the first half of the season see's him capitulating to the new world order, whilst the second half sees him working out how to take down Negan. This isn't really spoiling anything as it's pretty much a foregone conclusion that at some point the writers are going to have Rick rise up against Negan. Daryl, likewise, is going through his own transformation, being taken by The Saviours. This act is undertaken so that Rick must keep in mind that if he doesn't follow the rules, they have Daryl to murder. But Negan also sees something in Daryl and so attempts to break him in order to make him a fighter that is worthy of joining the ranks of the Saviours. Fans of the comic book series might think they know what's coming up, but the writers of the show have constantly juggled the storylines around killing some characters quickly or slowly and mixing up their deaths a little. The TV show still has characters that died ages ago in the comic books and likewise other characters that died in the comic are still going strong. Again, I don't want to give any spoilers away but if you're a fan of the TV show you'll get much more out of it if you also read the comics. There's a character called Holly in the comic books who played quite a large part for a while... she appears in one brief scene in an earlier season of the TV show. This season's main villain is the infamous Negan. When I first heard that Jeffrey Dean Morgan was going to play him I thought it this was a serious miscasting, but he's actually incredibly believable in the role. There's just the right amount of charisma and unpredictability. But I thought the beard was a mistake. Worry not, he gets a clean shaven makeover eventually, which makes him even more creepy. Comedy - or even a gentle smile now and again - is something that has been greatly missing from the show. So, step forward Xander Berkeley whose comedic, yet sinisterly creepy take on The Hilltop's Gregory is spot on and easily one of the highpoints of this season. Likewise, Steven Ogg's Simon (Negan's right hand man) is creepy and unpredictable... and not a million miles apart from his role as Trevor in Grand Theft Auto V.
This season also introduces a fan favourite comic book character; The Kingdom Ruler Ezekiel, played by Khary Payton with his pet Bengal tiger, Shiva. I had a few issues with this release. Firstly it's spread over six discs - fine perhaps for the DVD, but the Blu-ray could easily have fitted these onto a couple of discs. The first five discs house the 16 episodes (as well as the audio commentaries), with the final disc playing host to all the extras. The picture quality on the Blu-ray discs wasn't as pin sharp as I was expecting. In fact it looked like a poor film transfer. My first thought was that it was part of the stylistic approach of the show, but I dug out an aired show copy to discover that while the quality of that broadcast wasn't as clear, it also didn't have the same grainy image. This isn't too much of an issue and shouldn't spoil your enjoyment of the show too much, and as the price difference between the DVD box set and Blu-ray box set is only £5 I'd still probably go for the Blu-ray. 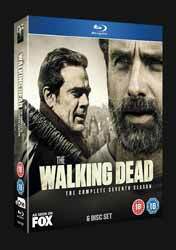 Extras include audio commentaries, with various cast and crew, on six episodes; Inside The Walking Dead (58 min, 23 sec - which goes through the season looking at various themes and aspects); The Making of The Walking Dead (49 min, 29 sec - mainly looking at various effects set pieces from across the season); A Larger World (10 min, 04 sec - explores how the show's world is expanding. Here we examine Sanctuary, The Kingdom, The Hilltop, Oceanside and The Heaps); Breaking and Rebuilding (5 min. 07 sec - looks at the breaking of Rick and the group and then how they build up alliances to take on Negan); A New Chapter of Fear (5 min, 04 sec - Look at opening episode and an exploration of how fear for the audience was driven by Negan's killing); The Writers (4 min, 01 sec - The writers talking about their favourite episodes, characters and other aspects of the show); Top Walkers (8 min, 29 sec - Looks at different and cool walkers this season); Warrior Women (7 min, 36 sec - explores the strength of the women characters in the show. When Rick is accepting of Negan's lead, these women don’t and all of them set about tackling Negan in their own way); In Memoriam (7 min, 19 sec - Look at some, but not all, of the characters that were killed off this season; and Deleted Scenes (A number of scenes which have to be played separately. The only really interesting one was the extended dream sequence from the opening episode). The audio commentaries are not overly interesting, but there are a few snippets of information that fans will appreciate. On episode 9, Alanna Masterson (Tara) points out a scene where she waves at the camera and she also reveals that at the episode's end Andrew Lincoln (Rick) asked her to do something to make him laugh... so she squeezed his bum. In episode 13 we discover that Madison Lintz's (who played Sophia in seasons 1 and 2) brother appears as Benjamin's little brother; and Lennie James reveals he smashed his TV set while practicing a new move, with his stick, which he'd seen on YouTube). Elsewhere on the disc it's revealed that Berkeley's performance as Gregory was so funny (he'd throw in new stuff each take) that no one could keep a straight face. If you look, you can see Lauren Cohan (Maggie) failing to keep it together on a couple of occasions). We also learn that Norman Reedus was excited when he thought that Daryl had made it into the comic books when Dwight was introduced to the series. He has the bike and crossbow, but Reedus quickly realised that they weren't introducing his character, just taking aspects of it. These aspects have been added to the TV series interpretation of Dwight. It's also discussed that Michonne, in the TV series, is taking on several of the storylines that were played out by Andrea in the comic book series. As fans of the comic book will know, Andrea continued to be a part of the comics for way long than her onscreen version. Yet another fine and nail biting season. All of the characters have their moment in the sun, with all of their individual story arcs progressing a little further.